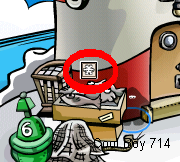 The Snowflake Tile Pin is at the Beach. The Card-Jitsu game is currently not working for ANYONE. When you try to play it, it says, “Sorry this room is currently full” or something like that.